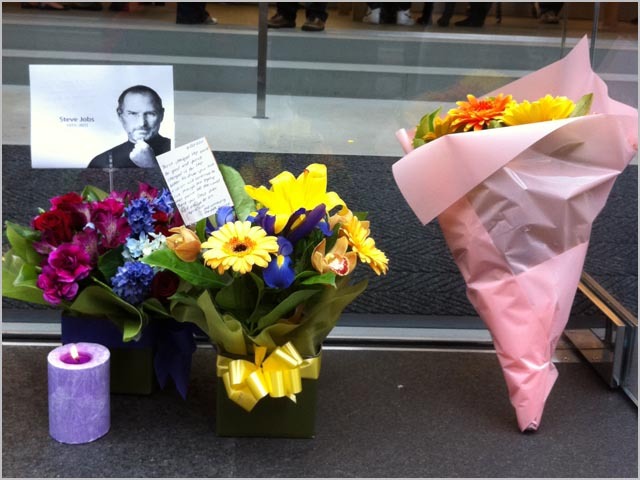 Fans pay tribute with a Steve Jobs memorial outside an Apple store in Sydney, Australia. Apple co-founder Steve Jobs didn’t invent the computer, the laptop, the mp3 player, the smartphone, or cloud-based storage. He didn’t create Pixar, the animation studio behind “Toy Story” and countless other beloved movies, and he didn’t come up with the idea of people paying to download music. But he had the vision to see the potential in all of them and make them unique, changing the world we live in. There were hundreds of MP3 players being designed at the turn of the millenium, but one emerged as “the” MP3 player: the iPod. First released in October 2001, it was just a white MP3 player with white earbuds, but the company’s genius ad campaign made it seem like the iPod was a completely different lifestyle. It wasn’t long before any other MP3 player was considered low-tech and the iPod defined the way we listened to digital music. At the same time, Jobs’ vision helped make legal downloads of music a viable source of revenue — not just for Apple, but for the music industry itself. Napster and dozens of other P2P file-sharing sites like it changed the way users consume music to the point where we expected (and some still do expect) to get music for free, without even considering it “stealing.” But iTunes changed that too. Earlier this year, iTunes celebrated its 10 billionth music download — that’s music that we’re paying for, and 10 years ago it seemed impossible. But Jobs managed to spearhead a revolution that, to a degree, saved the music industry. The iPhone was not the first “smartphone” either. But Jobs foresaw a future without physical keyboards, with beautiful screen displays, and with combining talking and surfing the Internet at the same time, he set the standard that all other smartphones compare themselves to. Android loyalists accuse Apple of making “new” features that have already existed, but that was Jobs’ power — he made everything seem unique, and fans ate it up. No other smartphone gets as much hype, speculation, or anticipation as the iPhone. Rumors spread like crazy for each device, and everyone claims to know what the next one will look like and when it will come out. The media doesn’t do stories on any other product that doesn’t exist without facts or confirmed sources — except the iPhone. Lastly, Jobs should be given a ton of credit for the iPad. At no time was anyone saying to themselves, “Hmm, I wish I had a computer that was smaller than a laptop but too big to fit in my pocket.” Yet the visionary then-CEO convinced the world that we needed tablet computers, and every other technology manufacturer followed suit — suddenly, millions thought they “needed” a tablet. And the iPad is now “the” tablet. Jobs may be remembered most for all of the “things” he oversaw and helped create, but he should be remembered most for his vision. His iVision. All of the products he’s been a part of, it wasn’t the products themselves that were unique — it was Jobs that made us see them as unique. And therein lies the genius of his legacy. “Your time is limited, so don’t waste it living someone else’s life. Don’t be trapped by dogma – which is living with the results of other people’s thinking. Don’t let the noise of other’s opinions drown out your own inner voice. And most important, have the courage to follow your heart and intuition. They somehow already know what you truly want to become. Everything else is secondary… Stay hungry. Stay foolish.” — Jobs’ Stanford University commencement speech in 2005.